Working with animals can be a very rewarding experience. And there are many great career options that involve working with livestock species. Demand for these jobs — and their importance — are poised for more growth, as more and more people learn about self-sufficiency and sustainability. Livestock appraisers evaluate animals that are to be sold or insured, determining their market value, and writing a comprehensive report that justifies their valuation. Although there is nor formal degree in this field, there are several professional certification options for livestock appraisers. These can be obtained through the International Society of Livestock Appraisers (ISLA), the American Society of Agricultural Appraisers (ASAA) and the American Society of Equine Appraisers (ASEA). Of course, most people who work as appraisers tend to command a higher wage after being in the role after a certain time, so experience is definitely a factor. In 2017, the Bureau of Labor Statistics (BLS) reported a median salary of $54,010 per year (or $25.97 an hour) for those working in this role. Agricultural extension agents visit farmers, ranchers, and youth groups to educate them about important developments in the livestock industry. Simply put, these agents provide informal education to people throughout the country, from farmers to people living in both rural and urban settings. Agents must be very familiar with the types of agriculture and production that take place in their designated territory. Many agents are employed by state and county agencies. Entry level positions require an undergraduate degree, and graduate level coursework is preferred. According to Payscale.com, the average salary range for this job was $35,876 to $61,542 as of November 2018. Livestock judges evaluate and rank livestock animals that have been entered in competitions. They base their opinion on the conformation and quality of each animal, and they publicly share their reasons at the conclusion of each class. Judges must have expert level knowledge of the breeds they evaluate. It is common for judges to have a full-time career (such as being a livestock breeder), since judging is usually a part-time opportunity and only pays a few hundred dollars per day plus travel expenses. Meat inspectors ensure meat products comply with strict government standards for safety and quality. In addition to visual examinations of animals and carcasses, inspectors also collect tissue samples for further evaluation. They also conduct inspections of the facility to ensure products are accurately labeled and the facility is properly sanitized. Inspectors usually must have a two-year degree at minimum and generally inspect a variety of different food products. The BLS includes meat inspectors in the category of agricultural inspectors. The mean annual wage in May 2017 in this category was $43,390 or $20.86 an hour. Artificial insemination technicians monitor the heat cycles of livestock animals and inseminate them at the optimum time for conception. Their goal is to impregnate the animal on a single service. Technicians will also maintain the required records and may also be able to give vaccinations to livestock. The majority of A.I. technicians work in the dairy or swine industries. There is no formal education provided for this type of work. But you must receive certification in order to do certified artificial insemination work. The National Association of Animal Breeders has developed a series of industry standards and practices. Salary can vary widely based on the technician’s educational background and experience in the field. 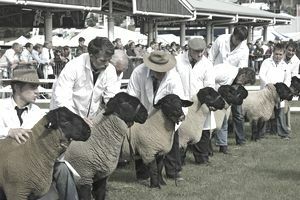 Livestock auctioneers sell animals at public auction, often using a chanting style of speaking to encourage bidders to continue to raise their offers. Auctioneers also do a great deal of administrative work before the sale such as assigning lot numbers, obtaining health records, and tagging animals for identification. Most aspiring auctioneers either attend auctioneering school or complete an apprenticeship. Licensing is required in some states. Many may work for auction companies, while a majority of auctioneers are self-employed. They can also auction off other things like real estate or farm equipment. According to SalaryExpert.com, salary for livestock auctioneers in major cities ranged from $44,901 to $76,458 as of November 2018. Breeders may choose to specialize in beef production, dairy production, swine production, poultry production, egg production, or sheep production. Breeders must be experts in animal husbandry (the breeding and caring of farm animals) and have knowledge of the reproductive technologies used in their industry. Many breeders will maintain records of insemination, births, and pedigrees. There is no formal education in breeding, although many breeders will have an animal science, animal reproduction or biology degree. Experience is also a very important factor. Salary varies widely based on the size of the operation, the type of animals produced, and current market prices. According to BLS, the median salary in 2017 for a breeder was $37,560 or $20.89 an hour. Animal geneticists work to improve the heritability of highly desirable traits in livestock species (such as increased milk production in dairy cattle or higher carcass weight in beef cattle). They may also be involved in conducting population studies and mapping genomes. Many geneticists working in the livestock industry focus on cattle or poultry. They usually pursue graduate degrees, though a Bachelor of Science degree may be acceptable for entry-level positions. The BLS includes geneticists in the broader category of biological scientists, which reported a median annual salary of $60,330 as of November 2018. Livestock veterinarians are specially trained to care for farm animals like cows, horses, and chickens. Like those who treat pets and other companion animals, these vets will examine livestock, vaccinate them, treat their wounds and prescribe medication. Furthermore, they will aid in the delivery of newborn animals, and will also euthanize livestock whenever necessary. Many livestock vets are also specially trained to operate on animals. Livestock veterinarians must have an undergraduate degree and must graduate from veterinary school. Working with livestock and pets is also recommended while pursuing your degrees. All vets must be licensed to practice in their home states. The BLS does not differentiate between regular vets and those who deal with livestock. According to the most recent data, the median salary for a vet was $88,770 or $42.68 an hour.